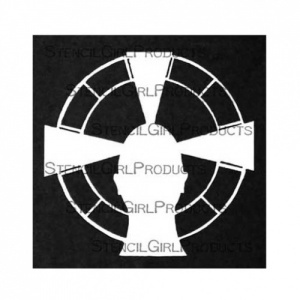 StencilGirl Products Stencil - Halo Radiant - S546. The Radiant Halo stencil by Pam Carriker radiates light and positive imagery. The radiant beams coming out from behind the mask of the face are a great place to add journaling, words or patterns on art journal spreads, mixed media artwork, scrapbook layouts and more.